One of our best-selling vintage wedding party favors! 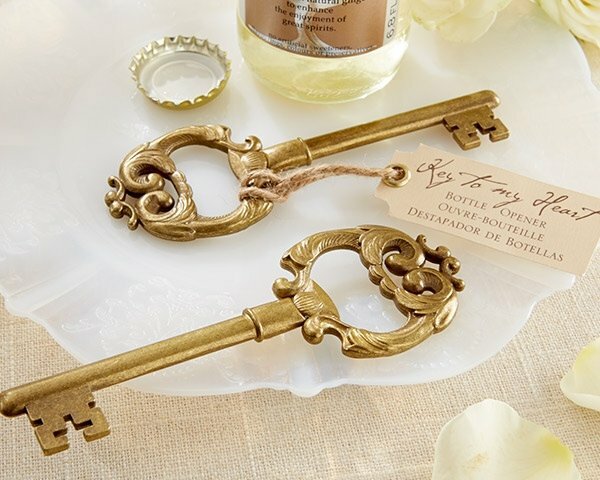 Add a touch of nostalgia to your event with these antiqued keys! Not only for opening antique doors, these keys have the hidden talent of opening bottles. Measuring 4 1/2" long by just over 1 1/2" wide, each metal opener has an antique-gold finish and comes with a hang tag that's attached with a natural twine bow. 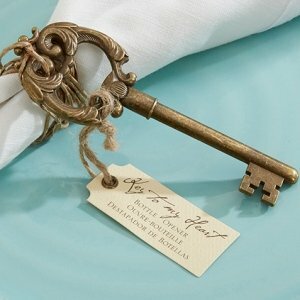 Whether they remember using keys like this or just appreciate fine antiques, this key will find a place in your guests' hearts! keys are packaged in a cellophane bag. For an extra fee, you can add a personalized tag in the design of your choice. Assembly required. Note: Each piece is antiqued by hand, so color variations may exist. Hello- Do you have a key in this finish with a Fleur De Lis design? Also, how can you personalize each key with either a date or names? Thank you! I'm sorry we don't have a Fleur De Lis key design. Also, you can enter your personalization after adding this item in your shopping cart. Would this include the basic tag attached to the key if we don't choose to personalize it? 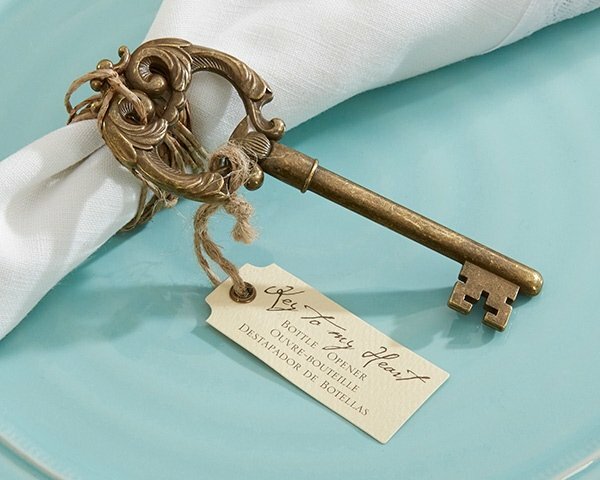 Yes, the 'Key to My Heart' Vintage Wedding Favor Bottle Opener will include the standard hang tag that's attached with a natural twine bow if you will not personalize it. Hello, I was wondering if I can get a sample of the key to my heart vintage wedding favor bottle openers? Yes, you can get a sample of the Key to My Heart' Vintage Wedding Favor Bottle Openers just enter 1 in the quantity box add to cart and complete the check out. Can we upload a graphic to use for tag personalization? What are the dimensions of the circle tag, and what color of paper will it be printed on? Unfortunately, only the design options listed on our site are available. I'm sorry, we're not able to accept other images or logos. We would like to order the Key to my Heart for a business event and personalize it with "Consistency is the Key to Success" on every card. Unfortunately we’re limited by the size of the card but you can purchse separate a different card that fits 34 characters or two lines. We have the Romantic Butterfly Large Rectangular Tags. One thing to note is these don’t have the hole punched and you’ll have to assemble it, but it does come on really nice paper.